Uh Oh. 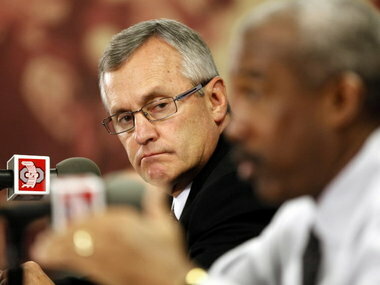 Report suggests big trouble for Tressel, Ohio State. A few months ago, when the controversy over Ohio State players selling memorabilia blew up, something didn't seem right to me. I wasn't sure exactly what it was, but I did make the comment (prompted by Jim Tressel's claim that all the players were returning in 2011) that: "Sometimes (Tressel) really reminds me of a car salesman, or at least an SEC coach." What I meant, and have stated in the past, is that I don't trust most of what Tressel says to the press, and since that's the only way I know him, basically I don't trust him all that much. I took some heat for the comparison, perhaps for not being a blindly loyal homer, or for daring to question the coach. But truth be told, I'm not a cynic, and I certainly don't wish ill on my alma mater Ohio State. But when something smells fishy, something usually is fishy. According to a report Monday from Yahoo! Sports, the SEC comparison might have been too close for comfort. At this point details are sparse, and there hasn't been comment from Ohio State or the NCAA, however Charles Robinson and Dan Wetzel of Yahoo! talk about a "two month investigation." What they claim goes right to "What did he know, and when did he know it." As we all know, Ohio State claims they were informed of the violations in December, and promptly notified the NCAA. And of course the university tried to take all the blame away off the players' shoulders. With some curious sentencing allowing the players to play in the Sugar Bowl, with a commitment to return and serve a suspension next year, the case was supposedly closed. Well according the the Yahoo! article, it might be wide open again, and this could be a very bad spring for Ohio State football. According to a source, a concerned party reached out to Tressel last April, alerting the coach that memorabilia transactions had taken place between (tattoo parlor owner Edward) Rife and a handful of Buckeyes players, including Pryor. The selling of items violates NCAA eligibility rules. The source said Tressel was troubled by the information, and the coach indicated that he would investigate the matter and take appropriate action. During the press conference in December, OSU said the university found out about the accusations on December 8. And at the same time, Tressel claimed that "we as coaches feel as if the buck stops here." If Jim Tressel lied to investigators, where the buck may stop might be just a bit higher on the ladder. Ohio State fans will be holding their breaths today, but I can't believe I'm the only one who feels a little ill with the whole thing.